Gov. Kashim Shettima of Borno has said that returning Internally Displaced Persons (IDPs) to Bama Local Government Area before Ramadan is no longer feasible because of current military operations in Sambisa Forest. Shettima had promised to return IDPs to liberated communities by 29, May. However on Tuesday, the governor announced a change of plan when he inaugurated 12 public infrastructure rebuilt by Borno Government in Bama with N360 million provided by the Victims Support Fund (VSF). The fund, established in 2014 with public donations, has retired Lt.-Gen. Theophilus .Y Danjuma as Chairman. The governor said: “Our goal was for our people to be able to return to Bama before this Ramadan. ‘’Unfortunately, this is not feasible because the military is still carrying out operations in some areas around the Sambisa as part of mop up exercise in the yet to be concluded fight against Boko Haram. “We will continue to work with security agencies to review situations. Our number one priority is the security and safety of our people. “We will not allow any IDP return to any community that has not regained 100 per cent safety. “When IDP’S return to communities, they will still need to go to their farms, markets and to travel for economic and social purposes. He added: “We will not wait till eternity. Shettima said the government was laying r laying emphasis on Bama but paying attention to all parts of the state. 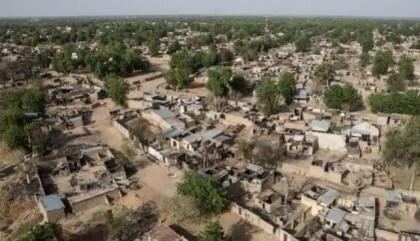 ‎”For the purpose of setting records straight, I think I should use this opportunity to once again explain that our focus is on all parts of Borno not just on Bama. “Our reconstruction works actually started in northern Borno where we rebuilt numerous public and private infrastructure in Kaga Local Government Area. He said Bama was getting the highest attention because it was adjudged the worst hit by the insurgency in the Northeast. He said the Post Insurgency Recovery and Peace Building Assessment conducted on the Northeast by the World Bank, the European Union, the Presidency and State Government in the northeast indicated so. ” More than 80 per cent of public and private infrastructure were destroyed by Boko Haram during their occupation. ” The Boko Haram as we all know, also occupied Gwoza but they did not destroy Gwoza as much as they destroyed Bama. Shettima said next to Bama in terms of massive destruction was Mobbar. ‘’We are currently working in Mobbar. We have deployed so much resources so that we also confront the rebuilding challenge” he said. In his remarks, Danjuma, represented by Vice- Chairman of VSF, Tijjani Tumsah, said the fund decided to intervene in Bama because it was impressed by the efforts of the Borno Government. He said while the fund provided N250 million for the reconstruction of 24 projects in Dikwa last year, the state government used the fund to rebuild not only the 24 projects but added 16 others.